Atlas is slowly realizing that we aren’t going to make him work and that when we come and spend time with him, we bring cookies or a brush to groom him, not a harness and collar. 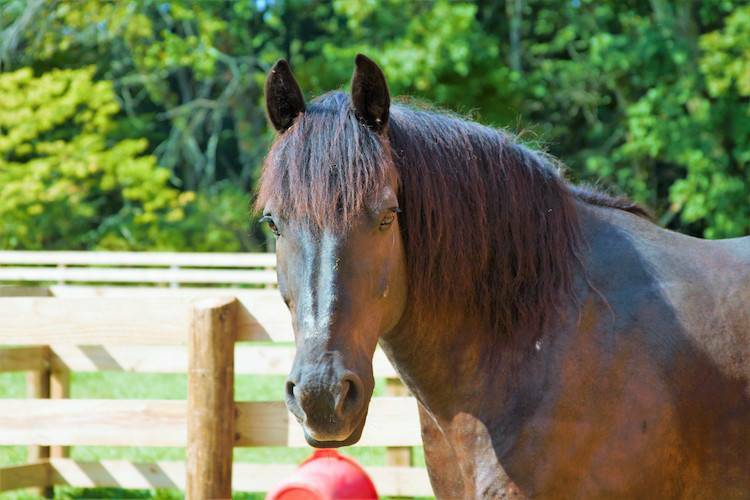 There is a new beautiful resident here at Woodstock Farm Sanctuary, Atlas the horse. Atlas wears the scars of pulling a plow on his chest and back. He was probably used on a farm and then auctioned off to be used as a carriage horse or for some other task. But as he has a bad leg that will never heal, he was again sent to auction where he was going to be sold for meat. Now our rescued yearling Trident has a friend – and he is so excited! Trident hasn’t been around other horses since he was separated from his mother when he was three months old. Atlas’ calm and gentle demeanor complements Trident’s boisterous personality very well and the two are already getting along. The horse pasture is against the woods and deer have been coming up to the fence to see this new big beautiful resident of the farm. Because he was used as a work horse, Atlas is used to people; but he doesn’t see them as friendly. He’s slowly realizing that we aren’t going to make him work and that when we come and spend time with him, we bring cookies or a brush to groom him, not a harness and collar. One day soon we know he will realize that Woodstock Sanctuary is his home and he will never be exploited again. When people hear the stories of Atlas and Trident, they’re often surprised to hear that a lot of horses end up as meat. But every month, thousands are shipped to Canada for slaughter. The horses on those death transports are hurt race horses, old carriage horses, or riding horses that are no longer wanted. Like other farmed animals, they are bred for a specific use and then end up at slaughterhouses — they just have longer lives than farmed animals who are bred to be eaten. 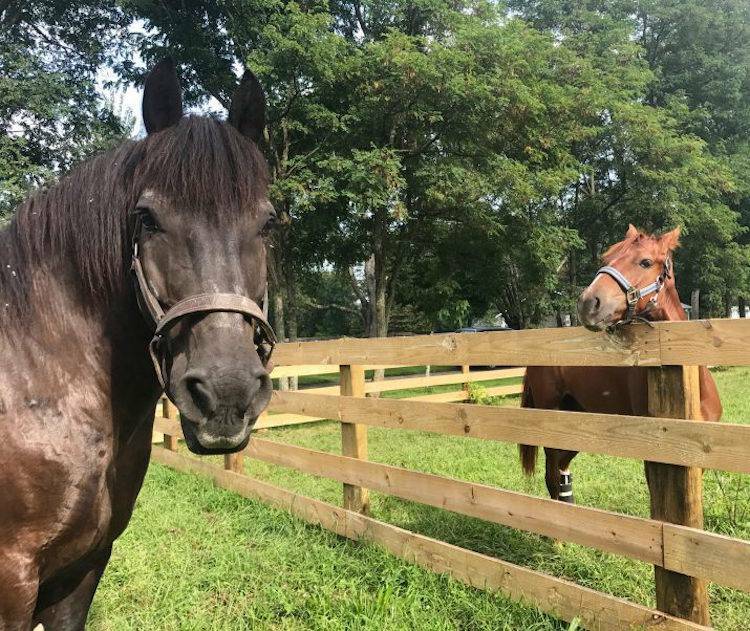 Atlas is here now because of our supporters…your generosity saved his life and will allow us to tell his story to save other horses from exploitation and death. When you come visit, please walk over and say “welcome” to Atlas. He no longer carries the weight of the world on his shoulders.